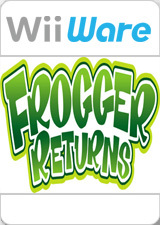 Frogger Returns takes the heart-pounding challenge of arcade Frogger and takes it into the next dimension! Classic top-down 2D gameplay is updated with colorful 3D graphics, a new perspective, all-new levels, new enemies and game-changing power-ups to dodge and use! Local multiplayer lets you race a friend to victory. The graph below charts the compatibility with Frogger Returns since Dolphin's 2.0 release, listing revisions only where a compatibility change occurred. This page was last edited on 23 May 2018, at 14:01.